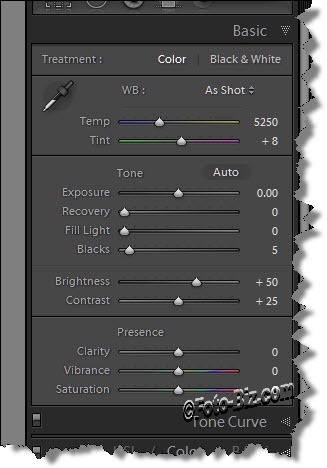 The vast majority of the changes done to a photo done in the Develop module are done in the Basic panel. Many people move this slider here, that slider there… But what do they do? Sets the overall brightness of the photo. Sets the white clipping point. Exposure values are equivalent to f/stops. Use the recovery to fix the highlights. Fix the clipped point to recover the highlights. Use the Alt/Option key while clicking on the Recovery slider. The photo will go black and show only the blown out highlights in red, green, blue or white. As you move the recovery slider to the right, the highlights will disappear. You are done when they are all gone or almost all gone. Builds a mask from the image itself and only applies the adjustment to the darker tones. Only affects the dark parts of the photo. Very easy to overdo and get washed out and noisy photos. Good to slightly overdo the Fill Light slider when printing on matte paper. Set the black point, under which all values will become back. Shift the values without change the white point. It’s the equivalent to a mid-tone curve adjustment that protects the highlights from clipping. Changes the contrast in the mid-tones. Increases the details in the mid-tones. Similar to the Saturation, but milder. Clipping is minimized as the colours get saturated. Greater effect on the less saturated colours than the more saturated colours. Good for the skin tones and the areas that are already richly saturated. Adjusts the intensity of all the colours in the image. All colours are treated equally.